The need to safeguard and backup critical company data is of paramount importance for today's businesses. An onsite storage device using Synology Network Attached Storage (NAS) is a good and cost-effective method to protect your business data as it ensures data backup and centralized storage. 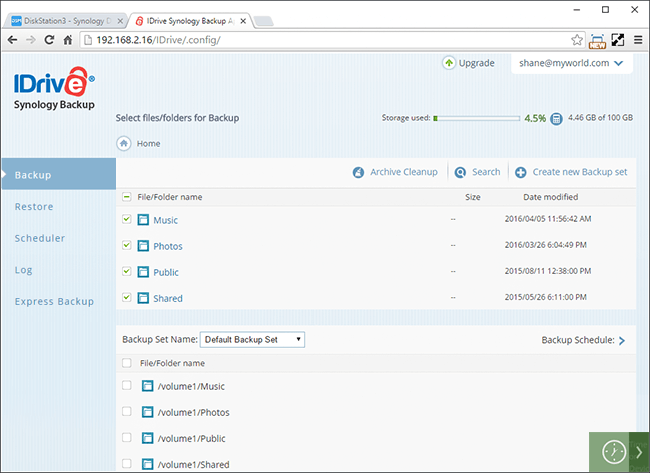 Using IDrive online backup to protect your Synology NAS device provides the protection you need, to keep your business running in case of a disaster. Backup your NAS device to IDrive and profit from an online storage and backup solution which is economical, secure and high-performing. 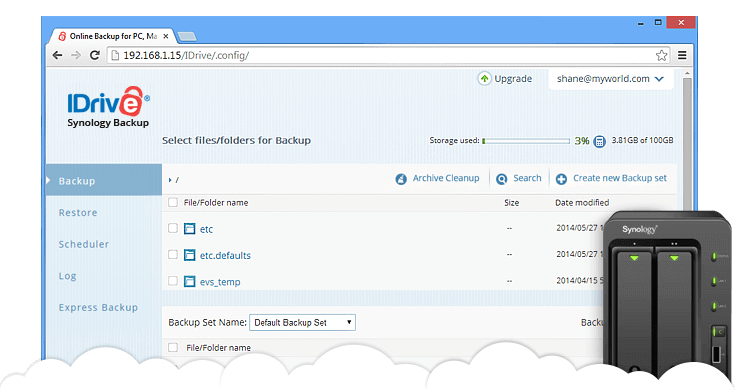 With the Synology Backup App, you can schedule automatic backup and restore jobs, perform manual backups and restores, receive email notifications on completion of all scheduled backup operations and also view log details. All you need is an IDrive account to get started. Choose your Synology device series and model you want to backup, and click Download Now to download SPK for your Synology model. The selected Synology model number is either incorrect or not supported by IDrive. Note: Last two digits of your model number represents the series. If you are unable to identify the correct IDrive App package for your model, download the universal package. Note: Universal package might not work for non listed models. 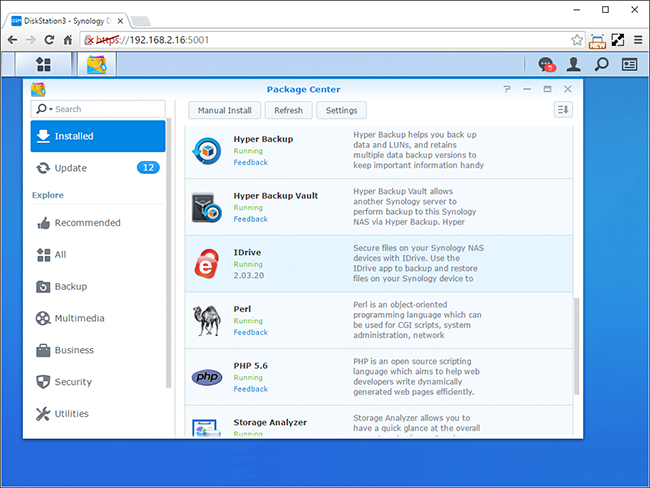 The Synology Backup App is packaged as a SPK. Separate installers are available for all supported Synology models. 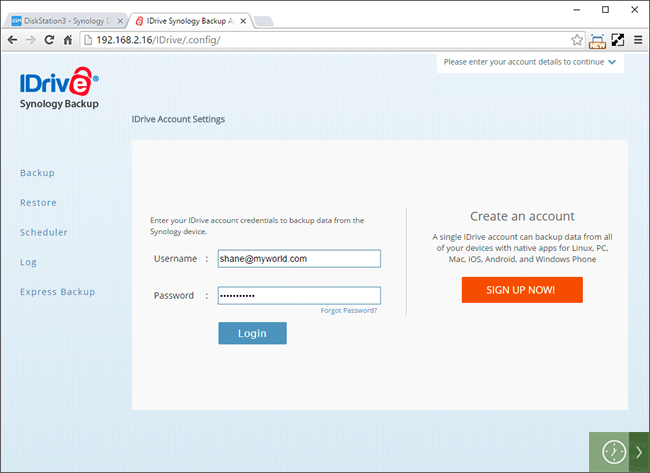 Enable web station on your NAS device prior to the Synology Backup App installation. Navigate to Control Panel > Web Services. Select Enable Web Station and click Apply. Navigate to Control Panel > Web Services > PHP Settings. Clear the Enable PHP safe_mode_exec_dir access limitation and Enable PHP cache check boxes and click Apply (if available). Navigate to Package Center > Utilities and install the Web Station package. Navigate to Package Center > Developer Tools and install the PHP package. Install PHP 5.6 if DSM version is 6.0.2-8450 or earlier. 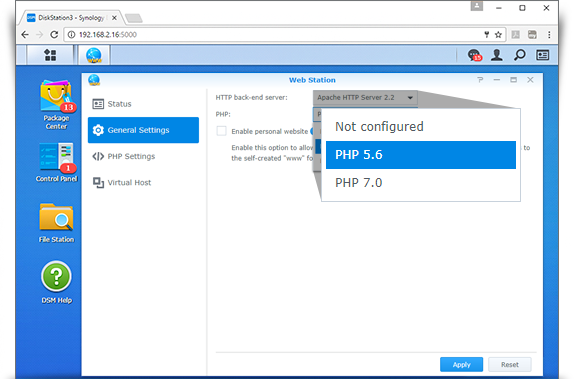 Install PHP 7.0 if DSM version is 6.0.2-8451 or higher. Navigate to Main Menu > Web Station > General Settings. Select HTTP back-end server as Apache HTTP Server 2.2 or Nginx. Select the PHP version which is selected in General Settings. Navigate to Main Menu > Web Station > PHP Settings. Select the PHP version PHP 5.6 or PHP 7.0. Enable PHP extension curl if it is available. Add '/etc:' in the beginning of open_basedir, if it does not already exist. Clear the Enable PHP cache check box if it is enabled." Navigate to Control Panel > Group > http > Edit > Permission. Provide Read/Write permission to the folder Web and click the OK button. Login to your Synology NAS device as 'admin' or as member of administrator group. Navigate to Package Center > All. Type IDrive in the search box, and click Enter. Find the IDrive App from the list that appears and click on the thumbnail to go to the details page. When the app starts running, will be visible in the application gallery. Click to launch the app. Navigate to Package Center > Installed tab and click the IDrive icon. In the Action list, click Uninstall, and on the confirmation message, click Yes. Backup or retrieve large amounts of data in less than a week using Synology Express — a physical storage shipment solution. 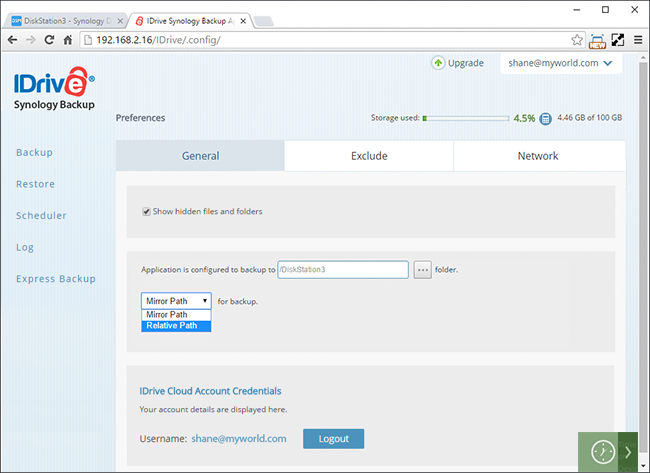 How Synology Express helps NAS users? Transfer large amounts of data from your NAS devices to your online account, in just a week or less. Throughout transfer and storage your data is protected using military grade 256-bit AES encryption with the option of a private key. After data transfer to your IDrive account is complete, you can perform incremental backups to keep your data safe from disasters. There is no consumption of bandwidth during the data transfer process. This service comes FREE for Express Backup, once a year for Personal users and thrice yearly for Business users. Subsequent backup requests will be subject to the $59.95 charge. Express Restores will be charged $99.50 per request. This service includes free return shipping for customers within the USA. Express orders shipped outside the United States may have additional shipping costs. Upon placing the order, our team will provide a shipping quote that will be charged separately. 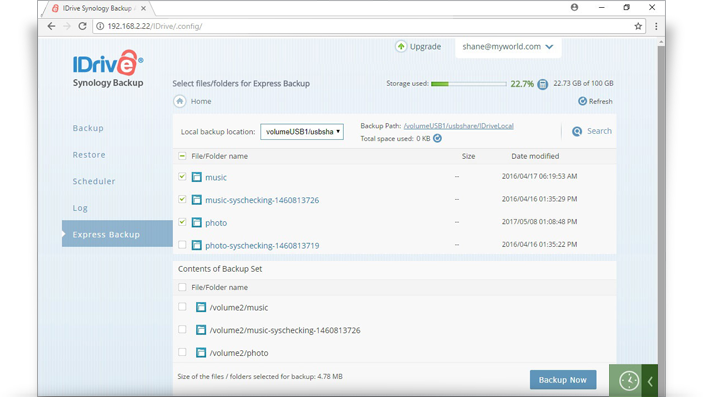 After receiving the express storage device, backup your data to the device. Your data is then transferred from the device onto IDrive's primary storage devices. Perform instant restores with express restore. You can safely retrieve all your backed up files/folders stored in your IDrive cloud account to your NAS device using an express storage device.